Portable Drum Rollers from Essex Drum Handling | Morse 55 Gallon (210 liter) Portable Drum Rollers, Drum Rotators or Drum Mixers mix the contents of sealed drums. Call Essex Drum Handling Toll-Free: (877) 742-5190 for Morse Drum Handling Equipment in NJ! Morse portable drum rollers & drum mixers are compact & easy to use. Compact, portable industrial drum mixers and drain stands roll the closed drum to agitate the contents and mix settled contents evenly. Mixing in a sealed drum gets rid of worker exposure and reduces clean-up. You can also dispense the contents of your mixed drum directly through a drum faucet or spigot. The portable drum mixer has a built-in tipping bar to provide leverage to assist in loading a drum upright onto the drum roller. Easily, set the drum back to upright position when drum mixing is finished. 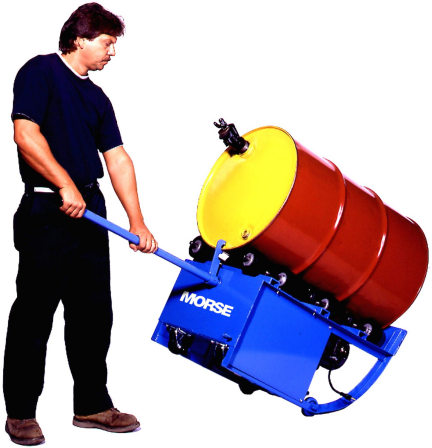 Essex Drum Handling is your #1 resource for Morse Drum Handling Equipment in New Jersey. 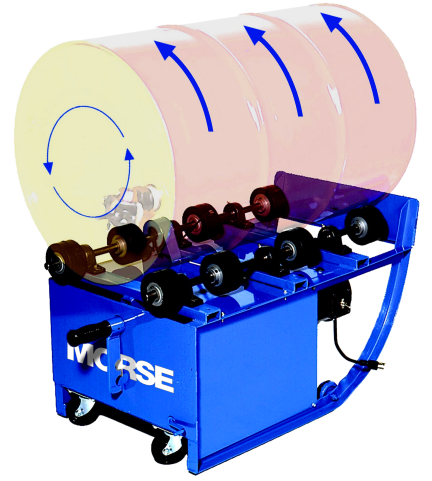 Morse 55-Gallon (210 liter) Portable Drum Rollers, Drum Rotators or Drum Mixers mix the contents of sealed drums. Compact, industrial drum mixers roll closed drums on their side and agitate the contents quickly so you don't have to. Eliminate worker exposure and reduce clean-up by getting rid of the insertion mixer. You won't even have to open the drum to mix stratified or settled ingredients. You'll be able to get all the sediments off the bottom of your drums conveniently and not waste any valuable chemicals that might have gone unmixed. Eliminate spills, unevenly mixed contents, and wasted chemicals from half-mixed 55 gallon drums. Portable drum rollers make your life easier and more efficient by mixing the contents of 55 gallon barrels safely & easily. Compact, portable industrial drum mixers and drain stands agitate the contents of drums in your shop or manufacturing facility with less hassle. Let Morse Drum Handling equipment make your job easier. Mix the contents of a sealed drum faster, eliminate worker exposure to harsh chemicals and reduce clean-up of potentially toxic materials. or a below-hook drum lifter. Up to 400 Lb. Dry Load. A shifting dry load exerts greater stress on the drum rotator. Stands just 19.25" tall when rolling a drum, making loading and unloading easier. Measures 21" wide x 34.75" long with drum in rolling position. drum onto the drum roller. The belted drum rollers have a pair of belts between the rollers to turn drum (instead of 2 rows of wheels). Belts allow it to roll a fiber drum weighing up to 300 Lb. without damaging the fiber sidewall. 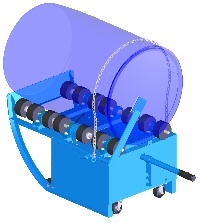 Belted portable drum rollers are available with same drum speed and motor types. Plastic drums are soft-sided and lack the ridged ribs and rims of a steel drum. These plastic drums require special features to position them on the drum roller, and to prevent them from traveling lengthways during rotation. Three extra wheels on each side support your plastic drum. The weight is then distributed over a total of 14 wheels. Chain to latch around the top of the drum while tipping from upright to horizontal rolling position on the drum rotator. During drum rolling, the chain should then be released. Order this option factory installed on your new portable drum roller. Kit for field installation to roll a plastic drum on your existing portable drum roller. Place your drum roller into the cage and close it to begin rolling. When the cage is opened, the drum roller is automatically shut off. Install Morse Rotators in accordance with OSHA requirements for enclosure and interlock, etc. For OSHA compliance, see OSHA subpart O.1910.212 "General Requirements for all Machines." Power connections and motor controls must comply with applicable codes. Morse Portable Drum Rotators with standard 1/2 HP, 60Hz, 1 phase TEFC motor include switch, cord and plug. All other electric 55 gallon drum rollers (i.e. Explosion proof, air powered, 3 phase, etc.) are shipped without switch, cord and plug. These must be installed by electrician according to local codes and customer's preference. Models are also available with 50 Hz motors, however, expect a 20% reduction in drum RPM.